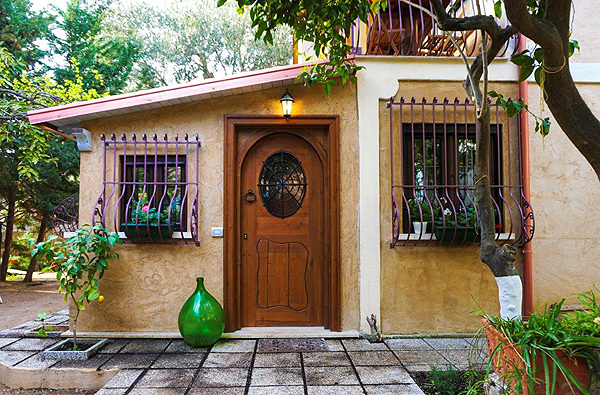 Amidst lemon, fig, olive, mirabelle and tangerine trees – yet right in the traffic-reduced center of Marina di Camerota - lies Villino Troccoli with its three apartments Morena, Morenita and Alice. Picturesque sandy beach bay Calanca is only 400 m and a short walk off. And a short stroll through the picturesque alleys of Marina di Camerota takes you to the lively harbor promenade and to piazza San Domenico. 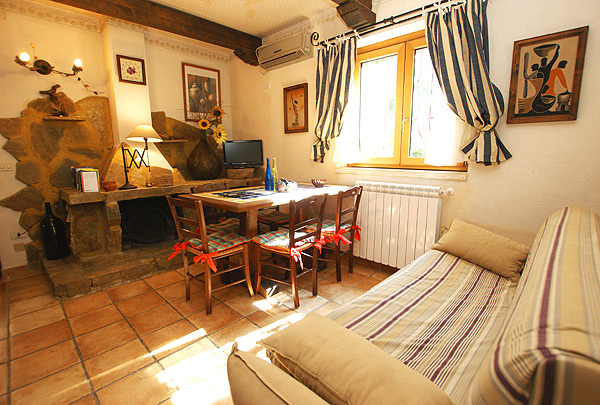 Each of Villino Troccoli’s three holiday apartments has its private entrance and outdoor area. 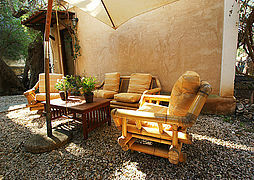 Apartment Morena is one of two apartments on the ground floor and accommodates up to five persons. The extravagant furnishing of the 45 m² apartment reflects owner Peppe’s love for the sea and for seafaring. The open living area with its long row of windows includes a sofa, TV, a dining area and a lovely kitchenette. 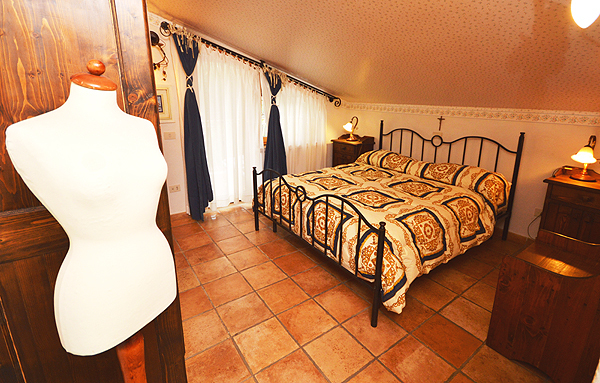 There are two bedrooms and an elegant bathroom with shower cabin. The kitchen area is furnished with gas stove, oven and refrigerator with freezer compartment and opens onto the furnished terrace of the apartment. When staying at Villino Troccoli during low season, the individually styled fireside, central heating and air conditioning with heating system provide for warmth on cool evenings. One of the two bedrooms is furnished with a double bed, the other one with a bunk bed, which can be converted to sleep a 5th person. The washing machine and a basin for hand-washing are found in a separate room. 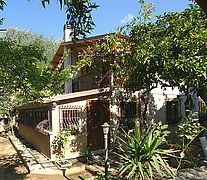 Morenita, the second apartment on the ground floor, accommodates two persons. It includes an open live-and-eat-in kitchen, a double bedroom and a bathroom with large shower cabin. The masonry kitchenette, adorned with quite a number of lovely items produced at Camerota’s ceramics works, is equipped with gas stove, small oven, refrigerator with freezer compartment and washing machine. This apartment, like apartment Morena, is furnished with air conditioning. 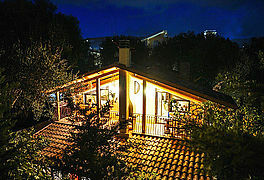 However, besides air conditioning with heating system, there is also a fireside as well as central heating. Furnishing of the live-and-eat-in kitchen includes a sofa, TV and a small dining area. Apartment Morenita’s furnished terrace with parasol next to the entrance is framed by bougainvillea and a gnarly olive tree. Holiday apartment Alice on the upper floor (with roof incline) is tastefully furnished and accommodates up to four persons, too. 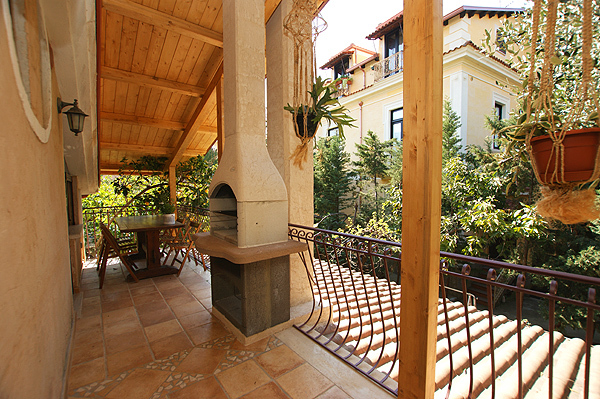 The apartment’s large, roofed balcony with masonry grill runs the width of the house. The somewhat larger of the two double bedrooms (each with double bed) opens onto the furnished balcony, which is also accessible from the living area. 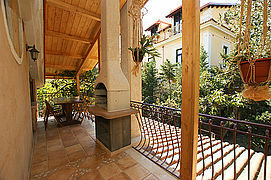 Besides dining furniture, sofa and TV, this apartment, too, has a fireside and air conditioning with heating system. The kitchenette includes gas stove, refrigerator, washing machine and microwave. 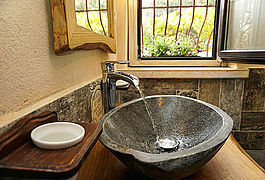 The bathroom is equipped with a bathtub with shower device as well as a shower cabin and WC. The solid wooden furniture of apartments Morenita and Alice harmonizes with the partly antique cabinets. The style of apartment Morena is dedicated to the topic 'sea and seafaring'. Ceiling beams, terracotta and wooden floors as well as a large number of colorful, blooming plants make for a warm atmosphere in and around the house. The out-door furniture of each apartment includes seating accommodations, deckchairs and a sunshade. Apartments Morena and Morenita share a masonry grill. You can park your car next to the house on the fenced property. Only a few paces from the harbor: Villino Troccoli with its three holiday apartments. Entrance to holiday apartment Morena. Come in and feel at ease in apartment Morena’s living area! The living area with sofa, fireside and TV (Morena). The kitchen area, which opens onto the apartment’s terrace (Morena). The double bedroom of holiday apartment Morena. The other bedroom with convertible (into a triple) bunk bed (Morena). The apartments have been furnished with a love for detail (Morena). Elegant bathroom with shower, WC and bidet (Morena). Catches your eye – the natural stone wash basin (Morena). Pick some fresh lemons – right in front of your door! 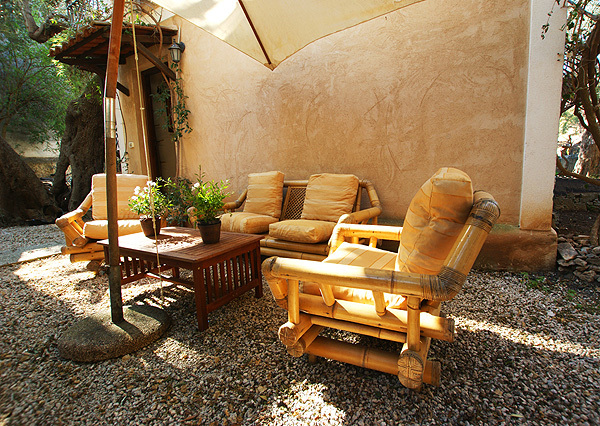 Furnished outdoor area of apartment Morenita. Living area with kitchenette, sofa and dining furniture (Morenita). Apartment Morenita includes fireplace, heating and air conditioning, too. 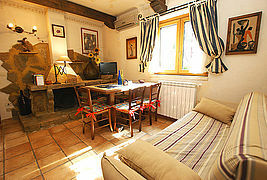 Glance into the double bedroom (Morenita). 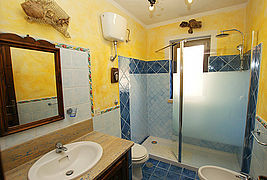 Bathroom with large shower cabin (Morenita). View onto Villino Troccoli. In the background, the church tower of San Domenico in the piazza of the same name. 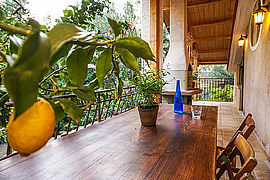 On the balcony of apartment Alice: fragrant lemons within your reach. 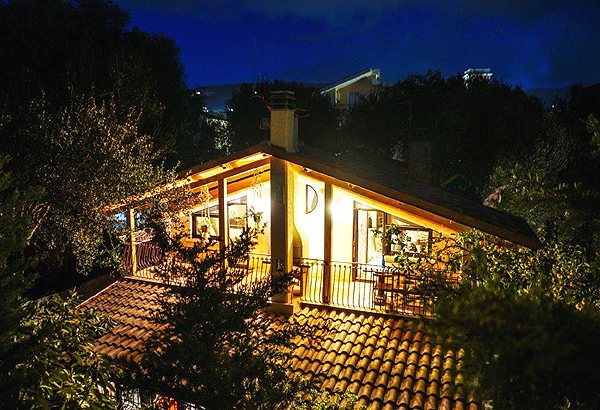 Charming evening atmosphere at Villino Troccoli. Roofed balcony of apartment Alice with masonry grill. 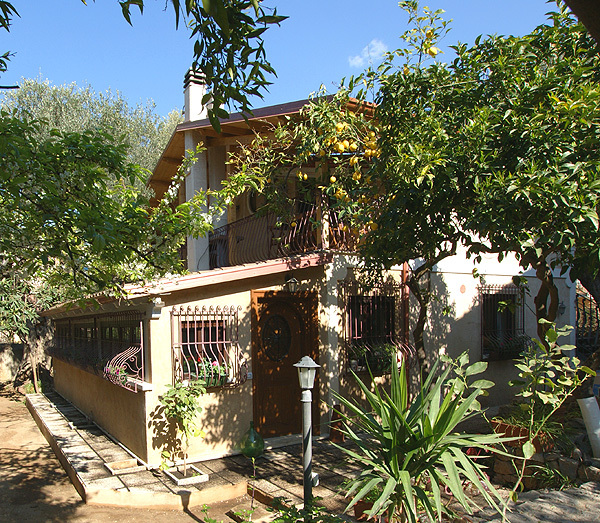 Villino Troccoli is situated in the beautiful centro storico of Marina di Camerota. Prices are valid per week and for the number of persons given in brackets, bed-linen, towels and final cleaning included. Costs for central heating/air conditioning are charged on the spot: € 50/week (heating); € 30/week (air conditioning). Wood for fireplace/grill: € 15/2 centner (100 kg). A deposit of € 150 (Morenita & Alice) / € 200 (Morena) is due upon arrival. Flexible days of arrival and departure (exception: in July and August only on Saturdays). Max. 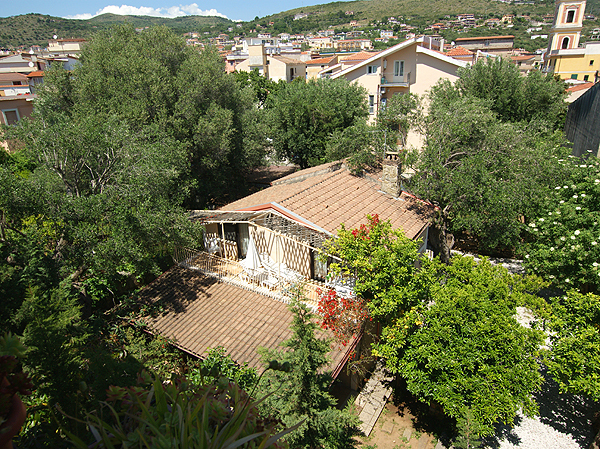 5 persons, 400 m to the sea, 2 bedrooms, Pets not allowed. Max. 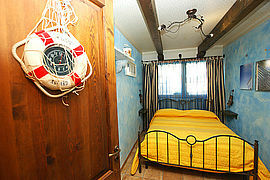 2 persons, 400 m to the sea, 1 bedroom, Pets upon request.